Other than Long John Silver, Johnny Depp, and Willie Stargell, Robert Surcouf is one of our greatest and favorite pirates who ever sailed the seven seas or played left field. 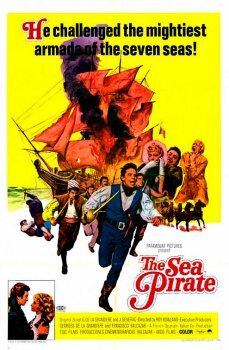 As befitting a man of such stature that I hadn’t heard of him until this movie, The Sea Pirate is not exactly the high profile vehicle these other pirates enjoyed (Treasure Island, Pirates of the Caribbean, the 1979 World Series), but that doesn’t mean his story isn’t worthy of an obscure mid 1960s Italian swashbuckler! It means that he’s deserving of two such films! But it also means that the second film, Il grande colpo di Surcouf has no known English release. But there’s enough run of the mill pirate movie elements in The Sea Pirate so that you sometimes feel like you’re sitting through both of them all at once! How else to explain the movie coming to a screeching halt halfway through so that Surcouf can sail to Paris to cry baby to authorities that the island governor where he’s from isn’t giving him his share of the booty from the English ships he plundered! The governor did have a point when he reminded Surcouf that he wasn’t supposed to carry cannons on board his ship while working for the government. But Surcouf also had a point that he had a freaking pirate crew to pay and keep happy! Making matters even worse, the governor is peeved enough that he sends soldiers down to the docks that night to keep Surcouf from sailing to Paris, effectively putting Surcouf on suspension! We all know what that means in the pirate business – teaming up with a sea captain pal who’s ostensibly neutral in the war between Britain and France, but who always seems to be hanging around the pirate tavern waiting to provide Surcouf whatever assistance he might require. And this time, it requires Surcouf to dress as a woman, complete with coconut ta-tas! And we all know what happens once the bad wig and ugly dress come off and our pirate hero finds himself in high society Paris – a gala ball! At least Surcouf is cool enough that he refuses to do any actual dancing and manages to almost single-handedly set French-British relations back at century when he responds to the British ambassador’s claim that the English are fighting for honor and glory by smugly stating “everyone fights, sir, for he hasn’t got.” And while the real life Surcouf is attributed with saying something similar to the British, The Sea Pirate does what all great cinema does and improves on real life by having Surcouf later fight this guy in a duel, only sparing his life because his wife (a gal Surcouf had the hots for) showed up! The film does reflect some of the events of Surcouf’s real life such as his capture of the British ships the Triton and the Kent, but wisely replaces the real Surcouf’s activities as a slave trader with a couple of subplots involving him romancing buxom wenches. His involvement with both women is strictly standard pirate movie fare. His girlfriend complains he loves the sea more than her and she seemingly abandons him before he can go to Paris, but she really was prevented from going by a jealous suitor. The other woman he meets is an American on her way to Paris who doesn’t like corsairs but likes Surcouf anyway. The speed with which the story demands Surcouf get over losing the love of his life to start romancing this new lady makes it all quite implausible, especially when it becomes clear this new woman was going to marry the ambassador and Surcouf was going to go back home and find out his first girlfriend never dumped him at all. Hey, what happens in a pirate’s pants in Paris stays in a pirate’s pants in Paris, right? Ships fire cannons at each other, the pirates board English ships and shoot and stab folks, and you even get some cagey pirate tactics from Surcouf as he alternately attempts to evade capture and capture the very ships who are after him. As decent as Barray was in those fight scenes, his lack of anything approaching a personality the rest of the story helps consign the film to its obscure status. He doesn’t get any help from his co-stars either (there’s no Livio Lorenzon here to liven things up) as the British Ambassador just has a different allegiance than Surcouf and the guy he fights at the end to get his girlfriend back is a snotty French official who wants to marry Surcouf’s girlfriend and whom Surcouf barely had any interaction with.